the first club™ - Audio Bøger - Get Up! ClubCoins Nødvendigt: 170 Please note that, for now, you cannot download content from our platform directly onto a mobile device (phone, iPod, iPad, tablets...). You need to download your items onto a PC or Mac, and then transfer them onto your device in the normal way. We are working on allowing direct downloads to mobile devices but this is not possible in the current version of the platform. Sorry about the inconvenience! From the codirector of the Mayo Clinic / Arizona State University Obesity Solutions Initiative and inventor of the treadmill desk comes a fascinating wake-up call about our sedentary lifestyle.That the average adult spends 50 to 70 percent of their day sitting is no surprise to anyone who works in an office environment. But few realize the health consequences they are suffering as a result of mode… rnity's increasingly sedentary lifestyle, or the effects it has had on society at large. 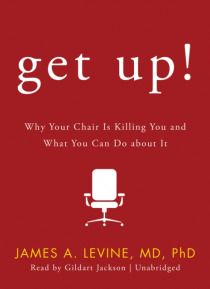 In Get Up!, health expert James A. Levine's original scientific research shows that today's chair-based world, where we no longer use our bodies as they evolved to be used, is having negative consequences on our health, and is a leading cause of diabetes, cancer, and heart disease. Over the decades, humans have moved from a primarily active lifestyle to one that is largely sedentary, and this change has reshaped every facet of our lives-from social interaction to classroom design. Levine shows how to throw off the shackles of inertia and reverse these negative trends through simple changes in our daily lives.